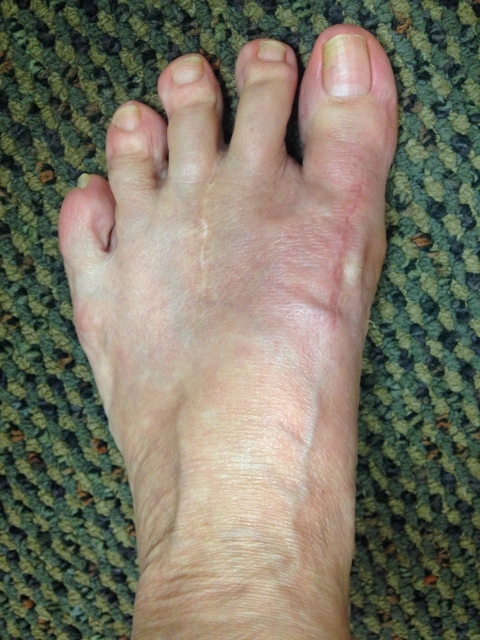 Before and 6 months status post bunionectomy. 1. What is this large bump on the inside of my foot? It is called a bunion. 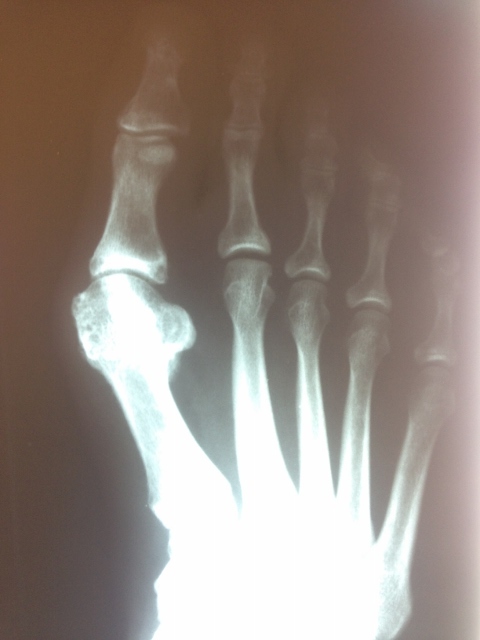 A bone is becoming more prominent on the inside of the foot. 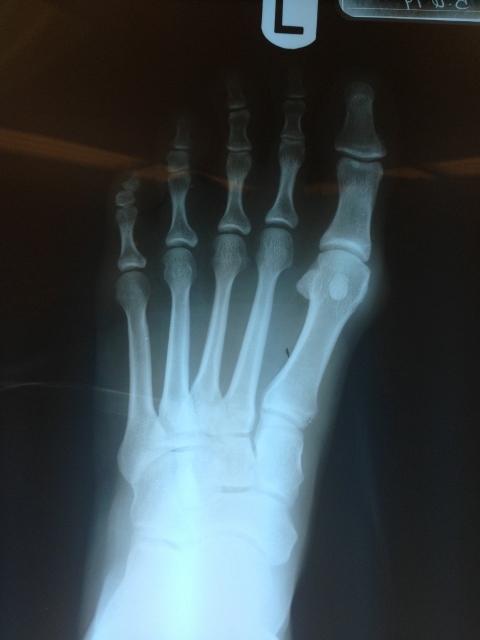 It is part of your normal foot and not a growth of new bone. The foot bones are starting to spread out, making the bone more prominent. 2. 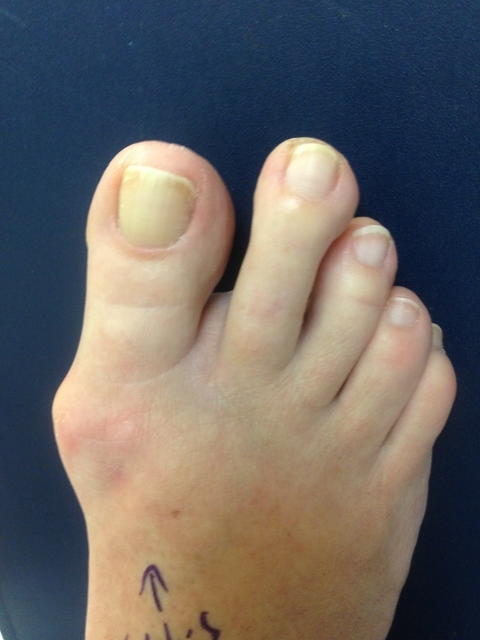 What is the cause of bunions? Most commonly it is hereditary. Tight shoes will often bring out the problem sooner. Poor foot structure (i.e. flat feet) may also contribute to the problem. 3. Can I avoid getting bunions if my mother and grandmother have them? Generally not. You may wear shoes that are wider in the toe box. This may delay the onset of bunions and prevent them from getting very painful. Eventually, a bunion will appear. 4. Will exercises of the toe or wearing of a pad between my toes help? 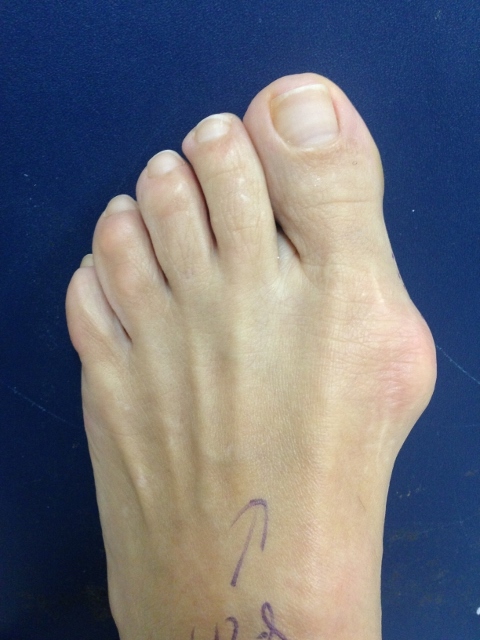 Pulling the big toe away from the second toe and wearing a toe spacer will be of limited benefit in the long term. 5. 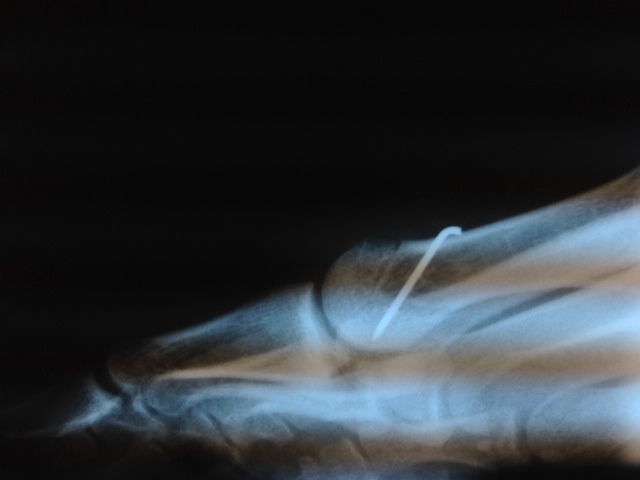 Do bunions get worse? 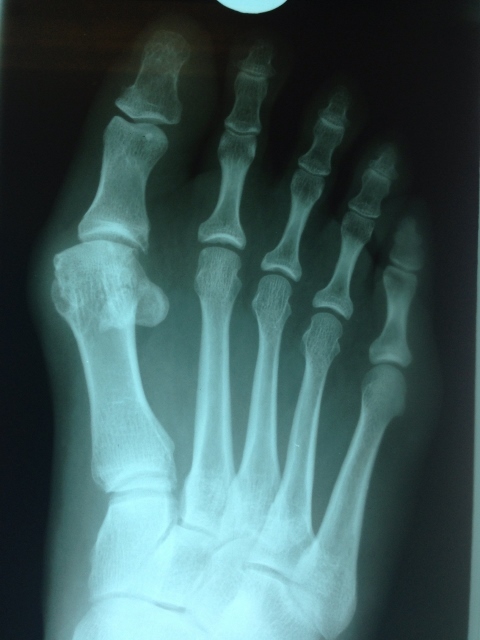 Over time the bones in the feet spread out further making a bunion appear larger. It may take months to many years, but they will almost always get worse. 6. Will I develop arthritis in the area? 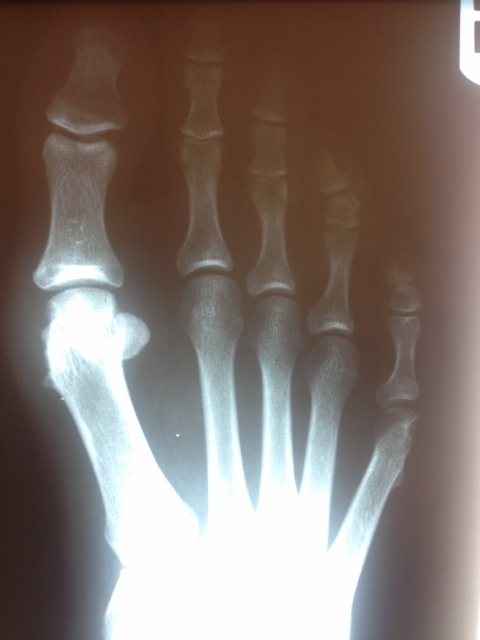 Over the years the big toe joint will become affected by the separating of the bones in the foot. Cartilage will start to wear thin and some degree of arthritis may develop. It may be mild, causing pain occasionally with the movement of the toe or severe, causing pain with every step. 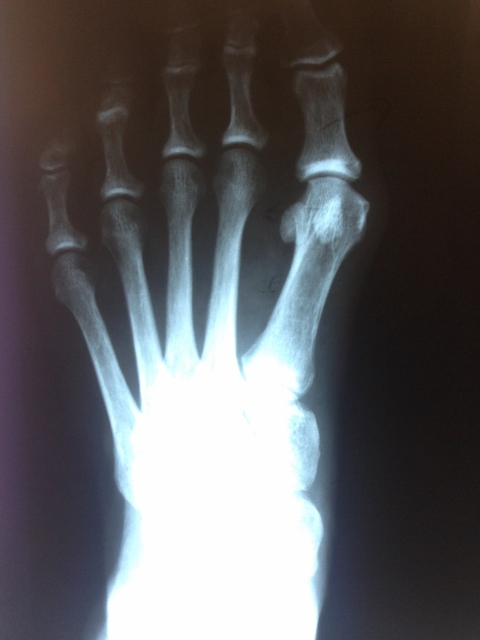 Arthritis that may develop is different from the pain directly on the bunion. 7. 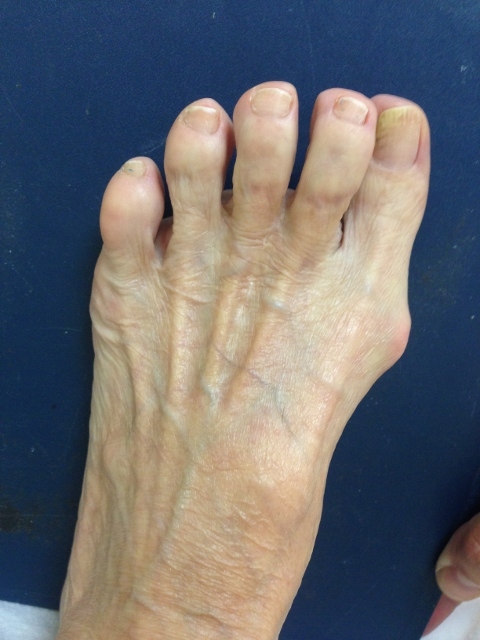 What causes the pain over the bunion? Shoes that are narrow put pressure on the skin, nerves, and bone. Numbness or tingling may also develop as the nerve gets compressed against the bone by tight shoes. 8. What can be done to help this condition? Wider shoes are the first step in the treatment process. This will take pressure off of the skin, nerves and bone. If the foot is functioning poorly an orthotic (custom-molded inserts into the shoes) will help. Occasionally medication and physical therapy will be of some benefit. 9. 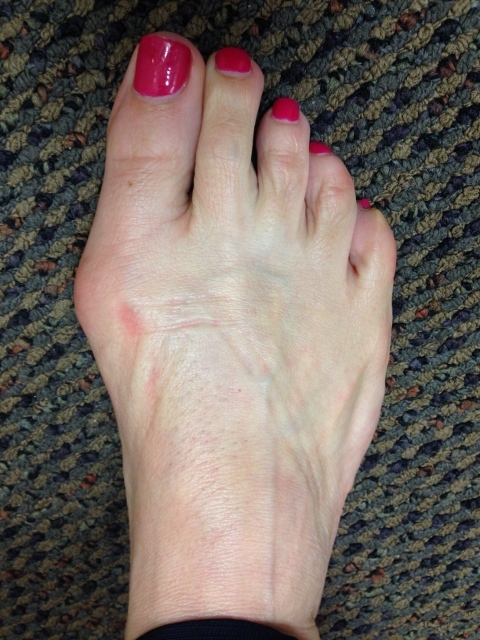 Can the bunion be corrected? 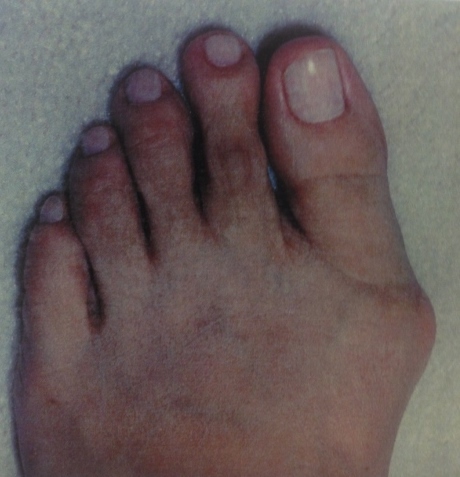 Bunions can be corrected surgically if the bunion is painful and it is unresponsive to conservative care. 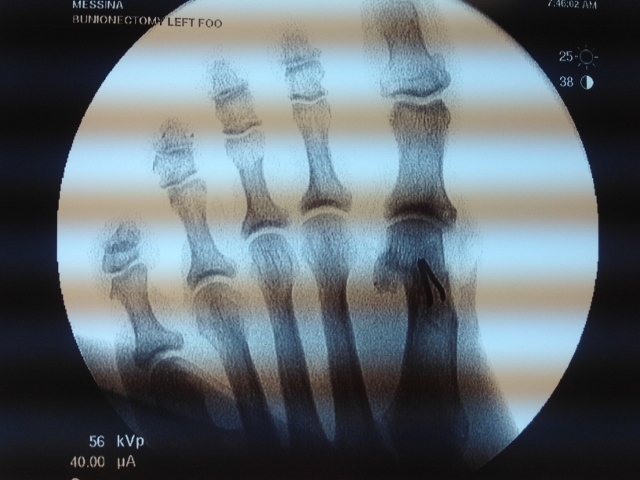 In some cases, small bunions hurt much more than large bunions. 10. What is the process of getting it corrected? Surgical correction may take place after a thorough history and physical examination. 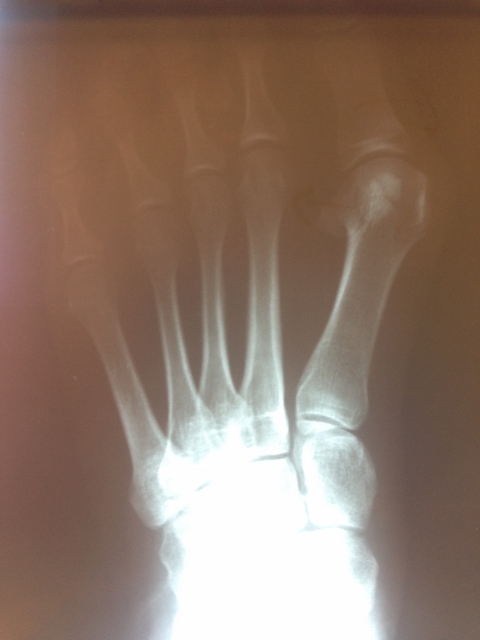 X-rays are performed to see the degree of deformity. A treatment plan is then formulated based on the physical findings and lifestyle of the patient. The procedures are done outpatient and patients choose the type of anesthesia they prefer. Some choose to go completely to sleep and others to be minimall sedated. The procedure takes less than one hour to perform and it is done without any hospital stay. 11. 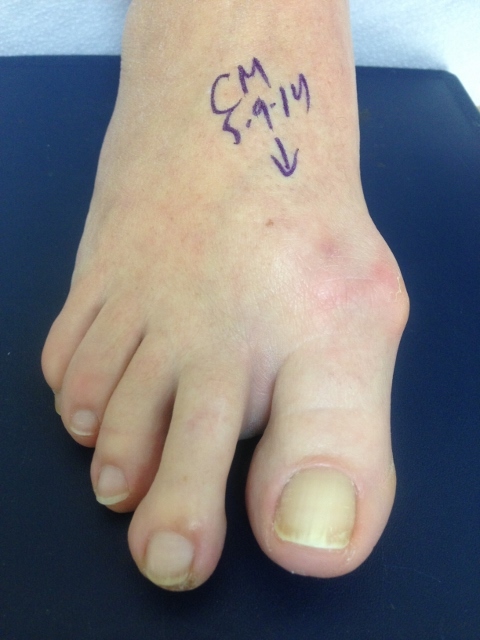 How is the bunion corrected? 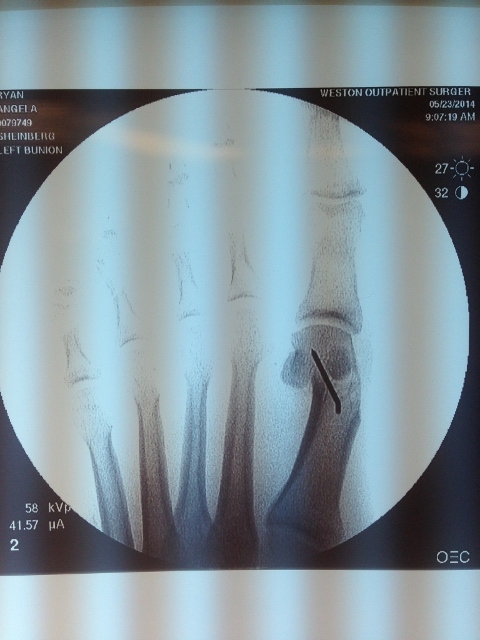 There are tight tendons and ligaments in the foot that need to be loosened and loosened tendons and ligaments that need to be tightened during the surgical procedure. 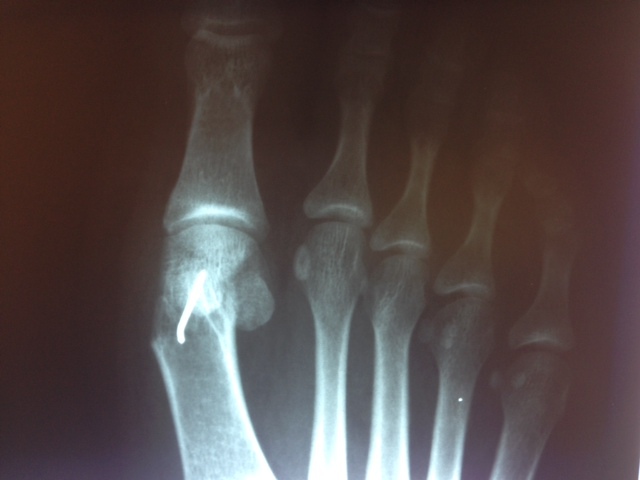 The bone that is sticking out is precisely cut with a special saw and it is positioned back into the foot. 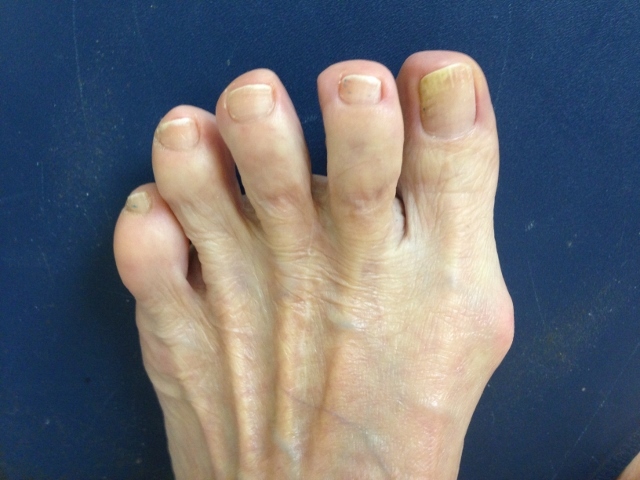 This allows the big toe to be straightened and the bunion to be completely eliminated. The union is not shaved or cut off as many people think. 12. Is it painful to have surgery? When done correctly by an experienced surgeon minimal pain is involved. 13. 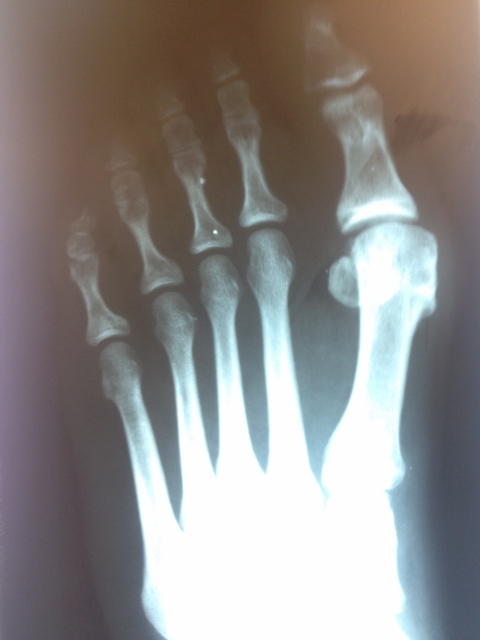 Can I walk on it immediately after surgery? We advise people to stay off their foot for two or three days. 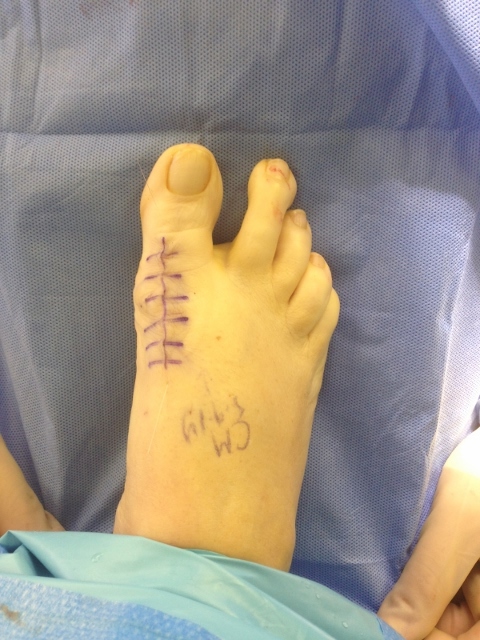 A surgical boot is utilized for a period of six weeks to protect the area and allow it to heal properly. 14. How quickly can I return to work after surgery? Usually requires four days of rest at home before returning to work. A special surgical shoe or boot is given to take stress off the area and prevent problems from developing postoperatively. 15. How long will it take to get back into normal shoes? For everyone it is different. It will usually take four to six weeks to get back into flat shoes or sneakers. Heels may take 2-3 months. 16. Will I be able to resume sports after surgery? Stationery bicycles may be used 1-2 weeks after surgery. Running sports and activities may require six or more weeks. 17. Would I be able to wear high-heeled shoes after the problem is corrected? 18. Will the bunion recur? In most cases, it will not if the surgery is done properly. 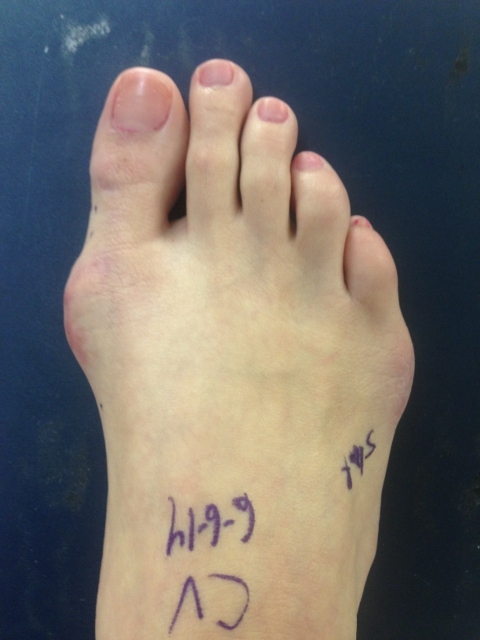 Patients with flat feet are more susceptible to recurrence many years later. Orthotics are often used to help prevent recurrence. 19. 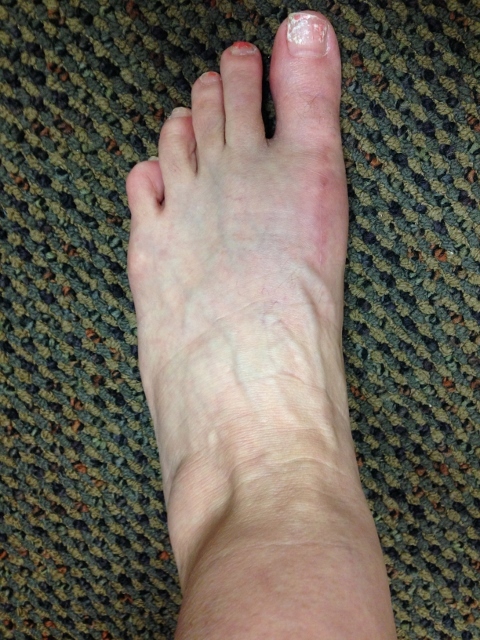 I had bunion surgery many years ago and it has come back. Can I do something about it? Yes. If the surgical procedure is done correctly a second time the results may be outstanding provided that there are no arthritic changes in the joint. 20. 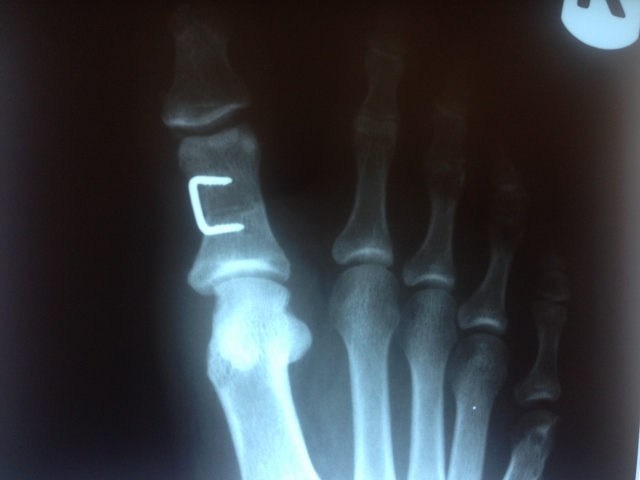 I have heard terrible things about bunion surgery. Why? Techniques have changed dramatically over the last 20 years. 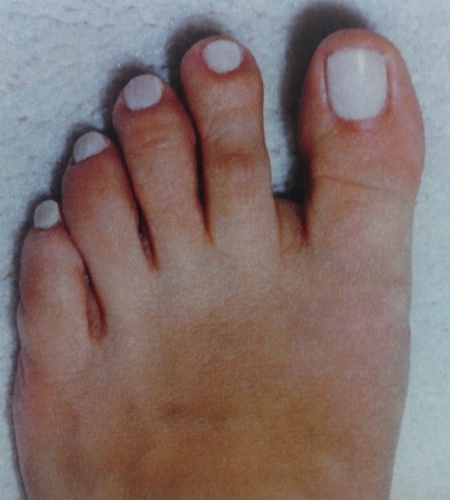 Bunions used to be shaved off, leaving the joint uncorrected. Pain and recurrence were common. 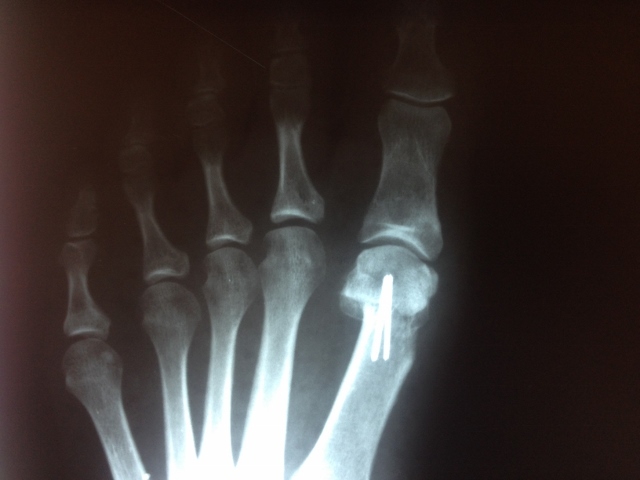 When performed by an experienced Board Certified Podiatric Surgeon results are usually excellent. 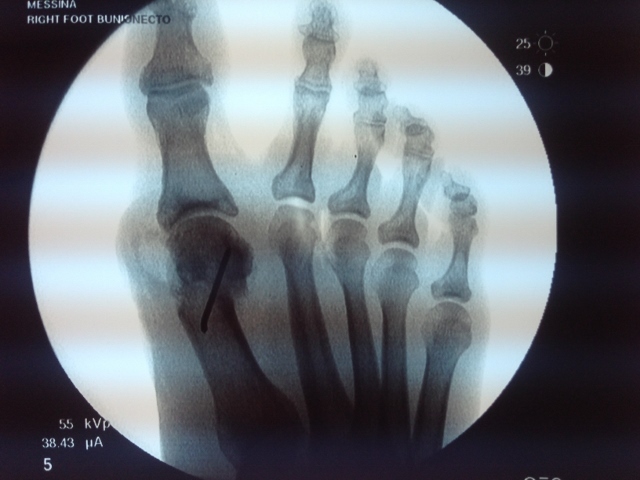 The doctors at Foot, Ankle & Leg Specialists of South Florida have performed thousands of bunion surgeries with great success and minimal complications. 21. 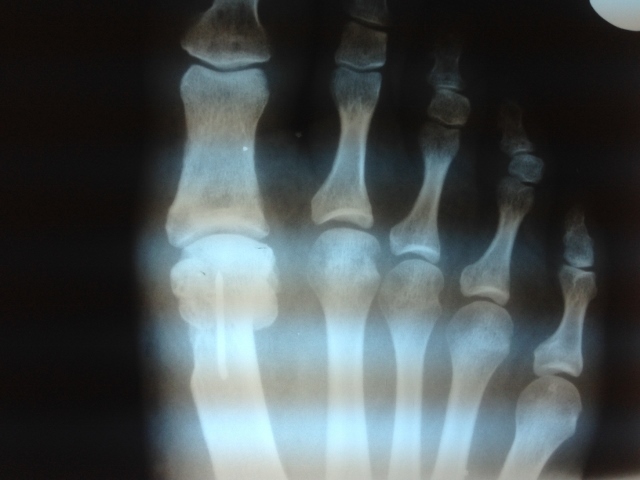 Are there any risks in doing bunion surgery? Any operation carries some risk. These can include infection (less than 1%), excessive scarring (rare and can be treated if present), delay in healing (more common in smokers), overcorrection (less than 5%. 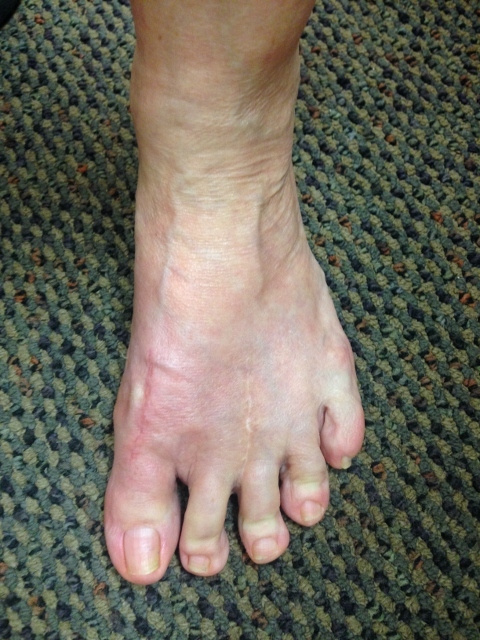 where the big toe drifts excessively to the inside of the foot), joint stiffness (normal after surgery and restored with time and physical therapy), swelling (common after any bone or soft tissue surgery), numbness along the incision (usually temporary) and recurrence of the deformity (more common in flatfooted people). 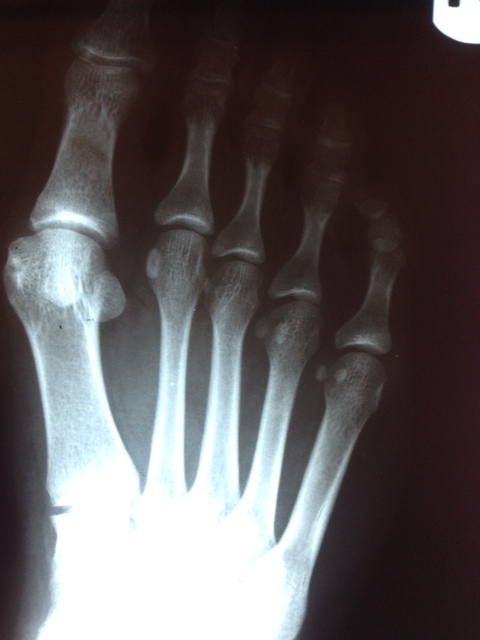 During surgical correction of the bunion a v-shape bone is made in most cases to translate the head of the 1st metatarsal laterally which creates an overhang of bone from the previous position of the bone (pictured left). 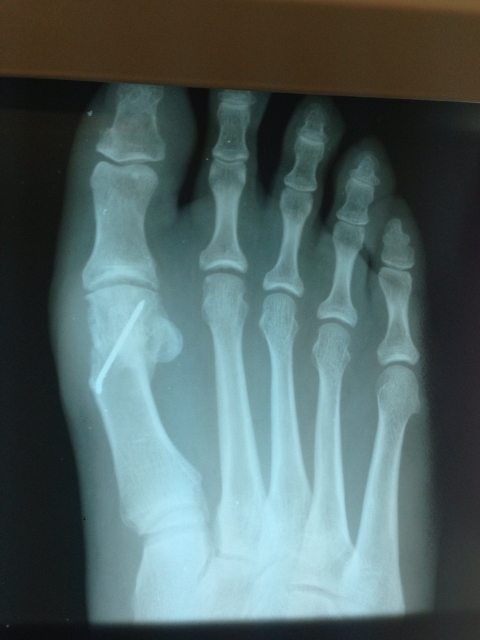 The overhang is remove and the new position of the bone is held with some type of fixation which varies from screws, staples, or pins which is the case here. 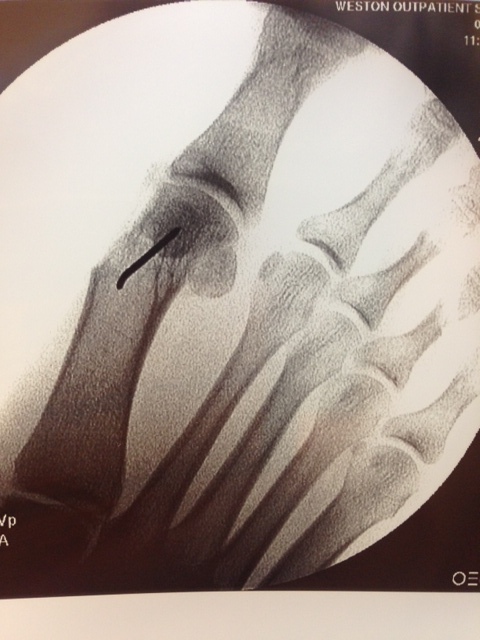 The pin is buried left in permanently (pictured right). 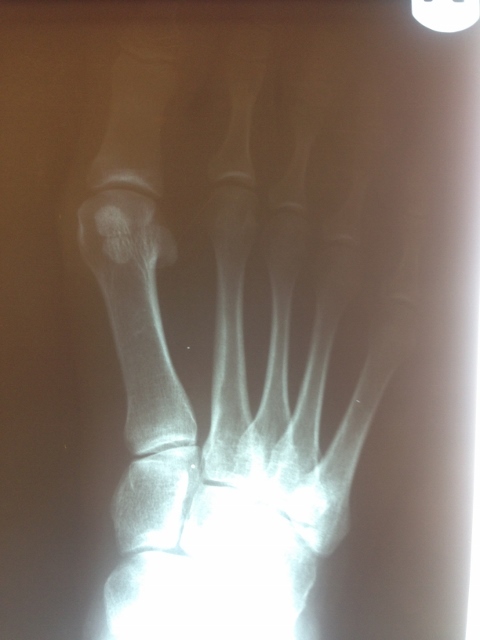 X-rays demonstrating correction of bunion deformity with the great toe deviated laterally (left image) and notice the position of the sesamoid bones which are the small round bones near the joint. 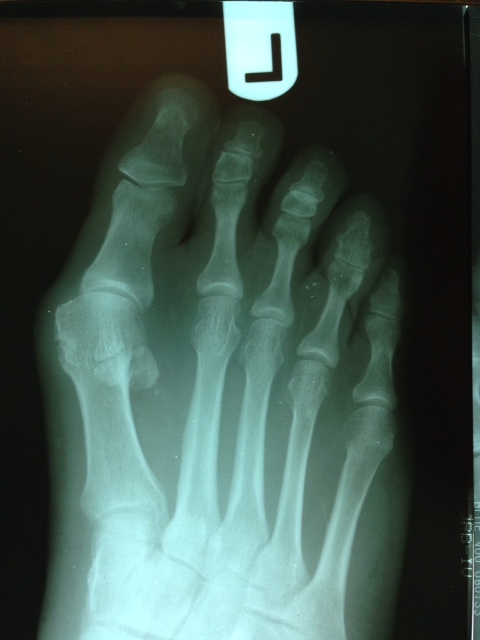 The post-surgical film (right image) depicts alignment of the great toe significantly improved and the position of the sesamoid is underneath the 1st metatarsal head where it should be. 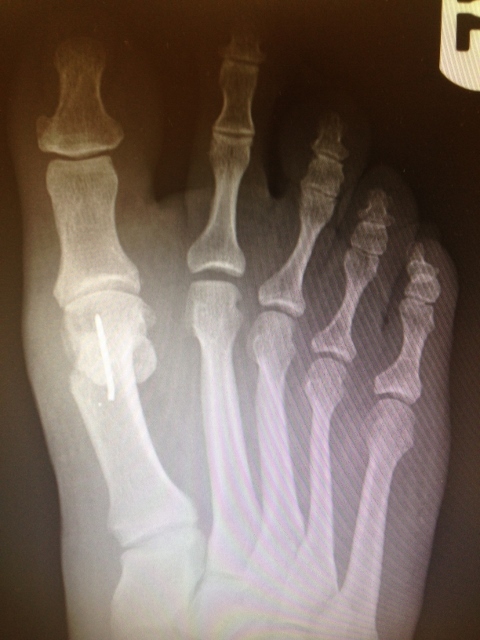 This is a case where two surgical screws were used to fixate the correction. 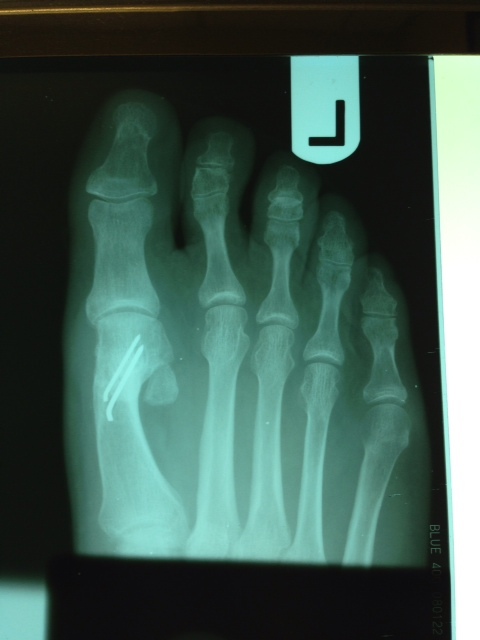 Pre and Postop Pics and X-Rays after Recurrent Bunion performed by other surgeon. 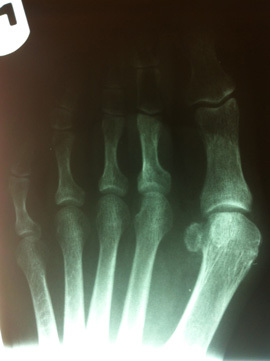 In the x-ray image below is a Hallux Valgus or what is more commonly known as a bunion deformity where the great toe is deviated towards the lesser toes causing abnormal structure which is a result of genetics, abnormal shoegear and abnormal mechanics will cause wearing of the joint and enlargement of the head of the long bone called the first metatarsal. 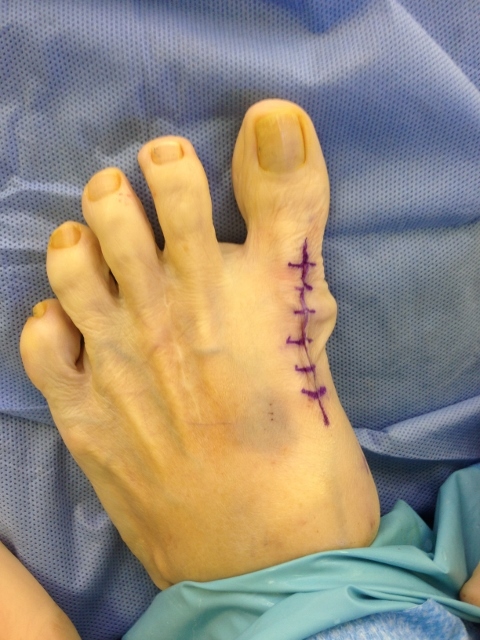 Post-surgical repair of the same patient bunion deformity with the great toe now in rectus (straight) position with surgically placed screws in the head of the first metatarsal that were used to secure fixation of the cut made across the bone to translate the head of the bone laterally in order to reduce the deformity. 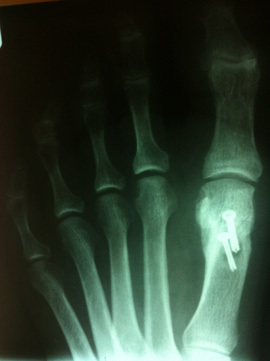 The screws will remain in place even after the bone heals.